This product review provides all the important facts about RevitaGen Stretch Mark Cream. According to the information gathered from the official site, this product reduces discoloration, wrinkles, fine lines, and stretch marks. It also improves your skin’s smoothness and elasticity, moisturizes the skin, and stimulates the production of collagen. Your will learn more about RevitaGen as you continue reading this review. Aloe Vera– has strong hydrating properties. It boosts skin moisture. Cocoa Butter- has similar properties as Aloe Vera. Cocoa butter is also a proven treatment for scarring and fading striae. Shea Butter- has hydrating and moisturizing properties. Palmitoyl pentapeptide (3)- stimulates the production of collagen, skin matrix, glycosaminoglycans, and elastin. It also plays a significant role in repairing damaged skin. Sigesbeckia Orientalis- has the ability to heal wounds by regenerating tissues. It also soothes inflammation. It aids in the regeneration of your collagen matrix, which in turn helps to restore damaged collagen, reduce stretch marks, and reduce scars. Retinyl Palmitate- consists of retinoic acid and Vitamin A, which help in maintaining a smooth and healthy skin. Retinoic acid adjusts the metabolism of skin cells, which encourages cell renewal and division. Acetyl hexapeptide-3- can prevent wrinkles. It also acts as a wrinkle relaxer. It works by reducing the contraction of facial muscles, which prevents the formation of long-term wrinkles and lines. The first step involves cleaning and drying the targeted area of the skin. Apply the cream in the morning and before bedtime. Massage it into your skin using radial movements until it is absorbed. Effects can appear quickly, but results improve after applying the product for about four to six weeks. The manufacturer of RevitaGen claims that this product is safe. It does not have any side effects. However, one of the participants of the test group developed some itching and rashes. In case these symptoms occur, call the service number written on the packaging. One tube (6 oz) contains a month’s supply and costs $69.95 on the official site. However, you can purchase this cream at discounted prices if you buy in large quantities. Two tubes cost $129.95 while three tubes and one free tube will cost the buyer $209.95. RevitaGen comes with 100 percent money-back guarantee valid for sixty days starting from the purchase date. If the product does not produce the desired result, return it within this period and have your purchase amount refunded. We also found many positive testimonials from users showing that most users are pleased with the results. We recommend that you try RevitaGen because it contains natural ingredients that have been proven to combat stretch marks and improve skin health. The merits associated with this product include a satisfaction guarantee and numerous positive testimonials from users. However, we found some drawbacks that may hinder some potential buyers from purchasing this product. For instance, the price of this product is relatively high even for discounted packages. Secondly, it can take up to six weeks before you experience the desired results. 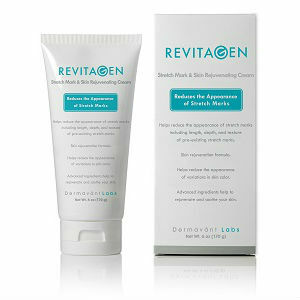 David Carney	reviewed RevitaGen Stretch Mark Cream	on August 15th	 and gave it a rating of 3.5.